Dr. Cook was involved for many years in the study of	the pathogenesis and epidemiology of avian viral diseases, particularly avian infectious bronchitis &lpar;IBV&rpar;, avian adenoviruses &lpar;including EDS–76&rpar; and avian pneumovirus &lpar;APV&rpar;. She was involved in the research and development of avian vaccines until retirement in 2000. 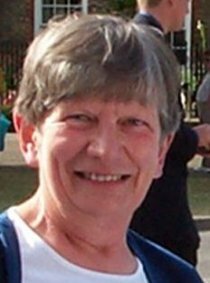 Since retirement she remains involved in the avian disease field as a consultant to different organisations, giving talks, and writing book chapters and review articles. Amongst other activities she is also an editor of the journal Avian Pathology. Cook, J.K.A. &lpar;1971&rpar;. Recovery of infectious bronchitis virus from eggs and chicks produced by experimentally inoculated hens. Journal of Comparative Pathology, 81, 203–211. Cook, J.K.A., Darbyshire, J.H. & Peters, R.W. &lpar;1976&rpar;. The use of chicken tracheal organ cultures for the isolation and assay of avian infectious bronchitis virus. Archives of Virology, 50, 109–118. Darbyshire, J.H., Rowell, J.G., Cook, J.K.A. & Peters, R.W. &lpar;1979&rpar;. Taxonomic studies on strains of avian infectious bronchitis virus using neutralisation tests in tracheal organ cultures. Archives of Virology, 61, 227–238. Cook, J.K.A. &lpar;1984&rpar;. The classification of new serotypes of infectious bronchitis virus isolated from poultry flocks in Britain between 1981 and 1983. Avian Pathology, 13, 733–741. Smith, H.W., Cook, J.K.A. & Parsell, Z.E. &lpar;1985&rpar;. The experimental infection of chickens with mixtures of infectious bronchitis virus and Escherichia coli. Journal of General Virology, 66, 777–786. McDougall, J.S. & Cook, J.K.A. &lpar;1986&rpar;. Turkey rhinotracheitis: preliminary investigations. Veterinary Record, 118, 206–207. Cook, J.K.A. & Ellis, M.M. &lpar;1990&rpar;. Attenuation of turkey rhinotracheitis virus by alternative passage in embryonated chicken eggs and tracheal organ cultures. Avian Pathology, 19, 181–185. Parsons, D., Ellis, M.M., Cavanagh, D. & Cook, J.K.A. &lpar;1992&rpar;. Characterisation of an infectious bronchitis virus isolated from vaccinated broiler breeder flocks. Veterinary Record, 131, 408–411. Cook, J.K.A., Jones, B.V., Ellis, M.M., Li Jing. & Cavanagh, D. &lpar;1993&rpar;. Antigenic differentiation of strains of turkey rhinotracheitis virus using monoclonal antibodies. Avian Pathology, 22, 257–273. Cook, J.K.A., Huggins, M.B., Woods, M.A., Orbell, S.J. & Mockett, A.P. A. &lpar;1995&rpar;. Protection provided by a commercially available vaccine against different strains of turkey rhinotracheitis virus. Veterinary Record, 136, 392–393. Cook, J.K.A., Orthel, F., Orbell, S., Woods, M.A. & Huggins, M.B. &lpar;1996&rpar;. An experimental turkey rhinotracheitis &lpar;TRT&rpar; infection in breeding turkeys and the prevention of its clinical effects using live-attenuated and inactivated TRT vaccines. Avian Pathology, 25, 231–243. Cook, J. K.A., Orbell, S.J., Woods, M.A. & Huggins, M.B. &lpar;1999&rpar;. Breadth of protection of the respiratory tract provided by different live–attenuated infectious bronchitis vaccines against challenge with infectious bronchitis viruses of heterologous serotypes. Avian Pathology, 28, 477–485. Cook, J.K.A., Huggins, M.B., Orbell, S.J. & Senne, D. A. &lpar;1999&rpar;. Preliminary antigenic characterization of an avian pneumovirus isolated from commercial turkeys in Colorado, USA. Avian Pathology, 28, 607–617. Cook, J. K. A., Chesher, J., Orthel, F., Woods, M. A., Orbell, S. J., Baxendale, W. & Huggins, M. B. &lpar;2000&rpar;. Avian pneumovirus infection of laying hens: experimental studies. Avian Pathology, 29, 545–556. Orbell, S. J. &lpar;2001&rpar;. Protection of chickens against renal damage caused by a nephropathogenic infectious bronchitis virus. Avian Pathology, 30, 423–426. Copyright 2019 Intervet International B.V., also known as MSD Animal Health. All rights reserved.